When the kids are naturals! 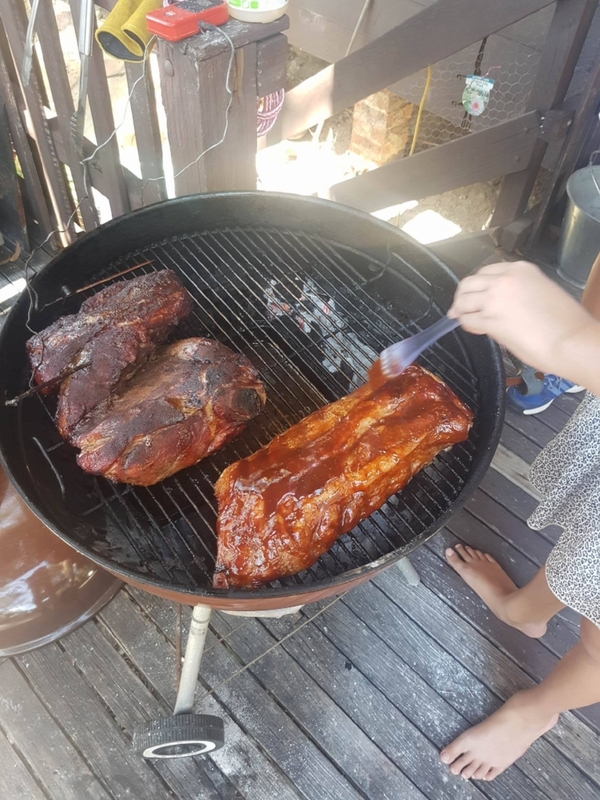 So we decided last week that we were going to get our 11 yr old, Chloe to make us some pork ribs on the weekend. Now, ribs use to be “our thing”. In our first comp, we took first place with one of the highest scores seen for ribs that year. In our second comp, we came second (on a count back) to one of the best teams on the BBQ circuit, BADASS BBQ. We were getting awesome ribs from our butcher Scott, who runs and owns East Blaxland Butchery. We were on fire! Then something happened. I don’t know what it was but our rib game took a massive dive. It dove about as low as it can go – dead last! Yes, we came last in ribs at Parramatta. I don’t know what happened, but they were over cooked, over sauced and just a massive fail. Just to prove I am not exaggerating, here is a photo of last place ribs – well deserved I think! I am not sure what changed but this method was no longer working for us so it was time to do some experimenting. Which brings me to last weekend. Chloe was in charge - she is preparing for some impending kid BBQ comps! Whilst I did guide her through, she did everything herself. And I also have to say, her lack of time management meant the ribs were wrapped for about 20 minutes more that I wanted, and I think, this is what made them so good!! Prep your ribs - you want to take the back membrane off the ribs. This is a bit tricky but worthwhile. Use a butter knife and then pull it off in one big piece. You don't need to do this step but I do just so the rub sticks to the ribs. I brush on some yellow mustard on both sides of the ribs, just a little bit - enough to cover them and make sure the rub will stay on. Get your rub. While I am not going to give away all my secrets here is the recipe I use as a base for my rub. I also use a good amount of Emu Rubs. Experiment and see what you like. It takes practice, but what better practice is there than eating ribs?? Put your ribs back in the fridge and prep your BBQ. Chloe used the Weber using Clean Heat Charcoal and apple wood from The Ministry of Smoke. You want your BBQ anywhere between about 225 and 250f. Once you are at temp, pop your ribs in the BBQ and just stand back and marvel at the amazingness that is BBQ (see above photo). Let the smoke do its thing for about 2 hours. Get a spray bottle with some apple juice and water in it and spritz your ribs after about 1/2 hour. Do this every 15 mins or so. After two hours, lay out some foil on a table and put your ribs on it. You want to put some brown sugar, butter and honey/maple syrup on both sides of the ribs. Then wrap them back up and back on the BBQ upside down. I was planning on leaving them wrapped for an hour but they ended up going for about 1.5 hours. I definitely think this is the secret to the success! Unwrap them and brush them with your favourite sauce. The sauce then needs to set, so cook them for another half hour to 45 minutes until it looks set. That's pretty much it. Take them off the BBQ, slice them up and enjoy! Looks like she is ready for some kids competitions! And quite possibly, she is now going to be in charge of ribs at future comps. A rainy weekend - the perfect time to BBQ! KFC chicken, that is not really in anyway like KFC chicken BECAUSE IT'S KETTLE FRIED CHICKEN!